Because Kingdom Hearts was everywhere. All the news you need to know from the Square Enix E3 Showcase, Ubisoft’s E3 Conference, the PC Gaming Show and the E3 2018 PlayStation Media Showcase! The third day of E3 2018’s press conferences is also the busiest, with four conferences for us to cover as we hear from platform holder Sony, publishing giants Square Enix and Ubisoft and media outlet PC Gamer! As with yesterday and the day before, we’re going to shut up right here and just let you get into the meaty, meaty recap! 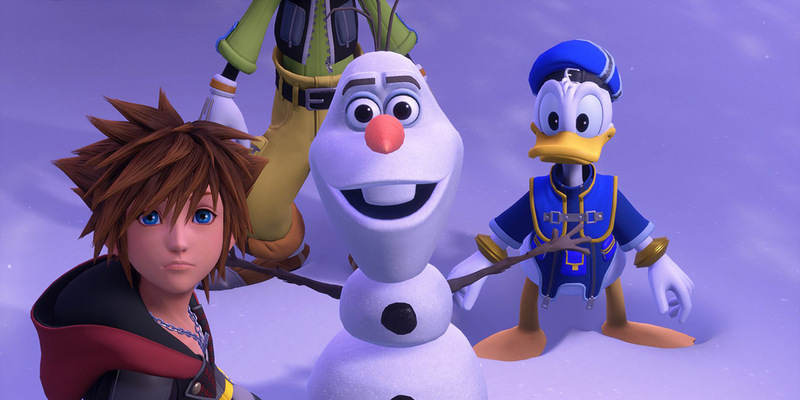 Pre-event: Kingdom Hearts III has been delayed… But it finally has a concrete release date! As if to steal the spotlight from EA Play, Square Enix took to the beloved series’ official Twitter account on Sunday afternoon to make a classic good news, bad news announcement. The bad news? Kingdom Hearts III has been delayed. The good news? It’s only been delayed by a month — it’s officially slated for release on PlayStation 4 and Xbox One on January 29, 2019. Game director Tetsuya Nomura followed the announcement up by explaining that the release date was announced at the KINGDOM HEARTS Orchestra World Tour event, and apologised that Square Enix is “asking for a little more time than initially planned.” Really, though, what’s another month or two when we’ve waited 13 years? Square Enix chose to open its pre-recorded presentation by sharing some more footage of Shadow of the Tomb Raider in the form of an extended gameplay video. Director Daniel Chayer-Bisson of Eidos Montreal revealed that alongside mechanics from previous Tomb Raider titles, Lara has added grappling hooks and wall running to her bag of tricks. Additionally, “full 360-degree swimming” mechanics mean that we’re sure to see Lara exploring some underwater environments. As announced at the Xbox E3 Briefing, Shadow of the Tomb Raider is set to be released on September 14, 2018 on PlayStation 4, Windows PC and Xbox One. Although Square Enix didn’t provide any more detail than the 55-second trailer, past experience informs that we should expect a number of quests allowing players to battle Monster Hunter: World creatures, as well as cosmetic enhancements and more based on the game. Set to begin this Spring, the event’s website notes that the “hunt for Rathalos” will only be open to level 70 characters who have already completed the Stormblood expansion quests. The Bayonetta and NieR: Automata developer shared a two-minute trailer that — as was the theme of the presentation — didn’t give too much information away. We do know that the game is set more than 3,000 years in the future (with a Judgment Day occurring in the year 5450) and is slated for release on PlayStation 4 and Windows PC at some point in 2019. We only know two things for sure about The Quiet Man: it’s coming to PlayStation 4 and Steam, and its main character appears to be deaf (and quite possibly mute). We don’t know who’s developing it, we don’t know what it’s about — all we’ve got to go by is a one-minute trailer that’s part live-action and part in-engine footage. Ubisoft Montpellier showed off one of the more fantastic trailers we’ve seen for its long-awaited prequel, introducing a host of new characters including the original protagonist Jade, chief cook Pey’j, the holistic chief medic Uma, and the Gambit-esque chief engineer, Callum. Narrative Director Gabrielle Shrager and Senior Producer Guillaume Brunier also revealed that the publisher has its teams in Barcelona, Spain, Bordeaux, France and Sofia, Bulgaria working hard on the game before also showing off some pre-alpha gameplay footage that just looks… Phenomenal. Brunier and Shrager then introduced Hollywood heavyweight Joseph Gordon-Levitt to the stage, who very enthusiastically revealed that his community-sourced production company, HitRECord, is teaming with Ubisoft to provide music and visual assets, the first of which will be shown off at BGE Fest in Montpellier this Spring. Creative director Julian Gerighty revealed that the raids will come as free DLC after the game’s March 15, 2019, bringing “new story, new areas to explore and new activities.” Each one will be set after the game’s main story. Prior to that, Gerighty also shared a stunning cinematic trailer and revealed that players will be able to choose a new Specialisation when they reach the end-game; all of this came in addition to everything that Ubisoft chose to reveal during Monday’s Xbox E3 Briefing. The incredibly well-received crossover was announced when CEO Yves Guillemot and Ubisoft Toronto’s Laurent Marville brought none other than Nintendo legend and prolific smiler Shigeru Miyamoto onto the stage and presenting him with a model of Fox’s Arwing ship. As one might expect, Fox will only appear on the Nintendo Switch version of Starlink, which is set to release on October 16 alongside PlayStation 4 and Xbox One versions. After weeks of anticipation, Ubisoft revealed Assassin’s Creed Odyssey, which allows players to choose between Alexios and Kassandra, two Spartan warriors who “share the bloodline of a legendary Spartan hero.” The game will not only feature naval battles but more traditional on-land, armour-clad Spartan battles, horse riding, swimming, partying and even fighting a bear. Ubisoft also graced us with an extended gameplay walkthrough of the “Trouble in Paradise” mission, which sees Kassandra traverse the beautiful Mykonos City. Assassin’s Creed Odyssey is set to be released on PlayStation 4, Windows PC and Xbox One on October 5. Valve announced that it is continuing its partnership with Perfect World Co. — which has launched both Dota 2 and Counter-Strike: Global Offensive in China before — to “actively promote Steam’s launch, marketing and games lineup” in one of the world’s largest markets. The companies did not provide a release window at the event, but we’ll be on top of it when they do. The popular genre gets yet another entry with Automaton Games’ take, which offers 1,000-player matches as opposed to the typical 100. The game also offers the ability to track opponents through footprints and wildlife and a range of environments within the same map, with Automaton hoping to add single-player missions and objectives as well. Also distinguishing Mavericks from the litany of other battle royale games on the market is its MMORPG-style social hub, which makes it a very interesting prospect indeed. Coffee Stain Studio takes itself a little more seriously this time around, with Satisfactory asking players to explorate, generate resources and eventually build massive factories. Engineers must build a strategy around expansion and automation, and can produce jump pads and moving walkways as well. Unlike many other games in the space, Satisfactory is presented in the first-person perspective, which is cool. Publisher 505 Games made the announcement in the title’s first gameplay trailer, which shows off the game’s four playable characters, each of whom come with their own backstory, skill tree and play style. The title is set to release on PlayStation 4, Windows PC and Xbox One on November 6 in North and South America; the rest of the world will have to wait until November 8. It’s a long way from its original 2016 release window, but we’re glad it’s finally here! Michelle Zauner, better known as the frontwoman of the indie-pop band Japanese Breakfast, provides the soundtrack for this graphic novel-esque open world adventure title. We’ve only gotten a peek at the game so far, but we do know that it’s heading to “PC and console” late next year. Naughty Dog debuted another trailer for The Last of Us: Part 2, once again exploring Ellie’s sexuality before the camera cuts to the ward in combat, showing off new mechanics including the ability to hide under cars and craft explosive-tipped arrows. Neither Sony nor the developer was prepared to offer a release date for the hotly-anticipated sequel yesterday, but we’ll keep on top of any new developments as they happen. Preceded by a live musical performance, the demonstration of Sucker Punch’s upcoming open-world game showed off the beautiful scenery of feudal Japan’s Otsuna Grasslands and gave us a better look at the game’s combat mechanics. The game is based around stealth — hence the name — and the debut gameplay footage shared some of the skills players will be forced to implement in order to survive. As with The Last of Us: Part II, Sony did not announce a release date for Ghost of Tsushima. The Alan Wake and Quantum Break developer has 505 Games on board to publish the third-person shooter, which features a female protagonist named Jesse using a shape-shifting gun to fight for control of her workplace from an “otherworldly threat”. Given Remedy’s penchant for secrecy, it’s no surprise we don’t know too much else about the title at this stage. The traversal wizards at Insomniac Games finally showed off some more of its Spider-Man experience by treating us to a whole mission. The demo showed off the phenomenal job Insomniac has done with Spidey’s web-slinging, and also introduced us to Electro, Rhino, Scorpion, Vulture and Mr. Negative as villains before something off-screen caught Peter’s attention. Marvel’s Spider-Man is set to be released on September 7, exclusively on PlayStation 4. Fans who pre-order the game will be able to kit Spidey out in the high-tech suit he wore into space during Avengers: Infinity War. …but we have now seen some gameplay! Léa Seydoux and Lindsay Wagner made their first appearances, adding to the game’s insane star power and confirming that Hideo Kojima’s first joint since splitting up with Konami back in 2015 is almost unmissable. There aren’t really many other words to describe the trailer, so just check it out. Kingdom Hearts III has been everywhere during E3 2018, but it’s only fitting that Square Enix saved its biggest announcement for Sony’s event. Alongside yet another trailer detailing the game’s Pirates of the Caribbean story — as well as the worlds of Tangled, Frozen and Monsters, Inc. — the company announced the stunning special-edition PS4 Pro pictured below, which comes with the KINGDOM HEARTS All-In-One Package which… Does what it says on the box. It includes KINGDOM HEARTS HD 1.5+2.5 REMIX, KINGDOM HEARTS HD 2.8 FINAL CHAPTER PROLOGUE, the “Impossible Odds” dynamic theme, and obviously Kingdom Hearts III itself. The All-in-One Package will also be available on its own, launching alongside Kingdom Hearts III on January 29. Square Enix used the Xbox E3 Briefing to announce Just Cause 4, which was leaked ahead of the event and will put players back in Rico Rodriguez’s frankly insane shoes… This time, with tornadoes. We learned a little more about Just Cause 4 in Square Enix’s Showcase: the setting (a fictional South American country called Solis); that extreme weather is not limited to tornadoes; and Rico’s grapple is now fully customisable with more features than ever. This is looking cool! Creative Directors Michel Koch and Raoul Barbet announced that Life Is Strange: The Awesome Adventures of Captain Spirit — which was announced at the Xbox E3 Briefing on Monday — represents players’ “first steps into [the] world” of Life Is Strange 2, with the game’s website revealing that players’ choices and actions within Captain Spirit will carry over and influence Life is Strange 2. We got another 30-second look at Octopath Traveller, the role-playing game that Square Enix is set to release on Nintendo Switch on July 13. We also learned of two special editions of Dragon Quest XI: Echoes of an Elusive Age: the Edition of Light, which includes some DLC bonuses, and the Square Enix Store-exclusive Edition of Lost Time, which includes a Steelbook case, a map of Erdrea, an art book and a “Symphonic Suite”. The game is set to release on PlayStation 4 and Steam in the West on September 4 after a year-long run of success in Japan. Redlynx’s Trials series makes its return, with Trials Rising set to be released on Nintendo Switch, PlayStation 4, Windows PC and Xbox One in February 2019. The game boast “more tracks than ever before” in the 18-year-old series, alongside a cooperative local multiplayer mode, a full career mode and the legendary Trials Track Editor. Despite recently being delayed into the 2019–2020 fiscal year, Ubisoft gave us another look at Skull & Bones’ naval battles and boarding mechanics. Donkey Kong is set to join the fun alongside Rabbid Peach and the also-debuting Rabbid Cranky Kong in Mario + Rabbids: Kingdom Battle as the Donkey Kong Adventure DLC releases on June 26. We got a look at the creepy-looking Transference, a collaboration between Ubisoft and Elijah Wood’s SpectreVision that is set to be released in Spring. An open beta of The Crew 2 is available to download right now; it goes live on June 21 and will stay active until June 25 ahead of the game’s June 29 release on Playstation 4, Windows PC and Xbox One. Ubisoft is offering the Windows PC version of For Honor for free for a week to promote the newly-announced Marching Fire expansion, which adds fighters from the Wu Lin faction and a 4v4 PvP mode called Breach. As with last year, Ubisoft closed out the presentation by bringing all of its presenters and staff onto the stage to thank the crowd for its support. That’s always lovely to see; Yves Guillemot is an absolute champion. Explosm Games, known for the Cyanide & Happiness webcomic, is working on its own battle royale title: Rapture Rejects, which pits 100 people into a battleground where they battle to survive the Rapture. Yup, the end of the world. Yakuza 0, Yakuza Kiwami and Valkyria Chronicles 4 are headed to Windows alongside Shenmue 1 & 2 and Shining Resonance Refrain as part of SEGA’s “Best of Japan on PC” initiative. Blindside Interactive’s latest offering, Maneater, sees players take control of a giant shark as it mauls everything in sight with no regard and no remorse. It’s exclusive to Windows PC, and has no release date as of this writing. We got another look at the recently-announced Destiny 2: Forsaken, this time focusing on the expansion’s story and the trouble that Cayde-6 has gotten himself into. Whoops. Call of Duty: Black Ops 3 is free on PlayStation Plus as of right now for a month, to promote a new Black Ops 4 pre-order deal; fans who pre-order that game will receive a free pack of fan-favourite maps — Firing Range, Jungle, Slums and Summit — for Black Ops 3. Leon Kennedy and Claire Redfield have certainly come a long way since 1998, as we can see in this first look at Resident Evil 2’s remake! It’s slated for January 25, 2019 on PlayStation 4, Windows PC and Xbox One. Team Ninja revealed Nioh 2, but that’s about all we know. Rick and Morty co-creator Justin Roiland is moving into video games with the hilariously weird Trover Saves the Universe, which is set to be released on PlayStation 4 and PlayStation VR. No release date has been given as of yet. Also on its way to PlayStation VR is FromSoftware’s other E3 2018 announcement, Déraciné, which puts players into the role of a “spirit summoned by a young girl in a secluded boarding school” and tasks them with proving the spirit’s existence and bonding with the students. The game — whose title translates to “uprooted” or describes someone who has been displaced — is set to release later this year.